Comic book aficionados who grew up in the 1970s may remember – if only dimly – a particular comic book that stood out from the rest because of the nature of the stories it presented. Military adventures featuring Sergeant Fury (Marvel Comics) and Sergeant Rock (DC Comics) eventually shared rack space with Weird War, a title with paranormal overtones that managed to hold its own against the more established offerings, delighting and terrifying readers with tales of hapless soldiers confronting ghosts, zombies and sinister figures from other times and places. Weird War owed its success, to a certain extent, to early ‘60s offerings such as Haunted Tank. But what the writers and illustrators of these works didn’t know, or most likely were not aware of, is the volume of high strangeness that has affected fighting men and women from various countries over time – situations and circumstances that would perhaps have strained the most devoted reader of Weird War and other publications – and which has been overlooked by the no-nonsense nature of the world’s militaries. On July 27, 2012, the Moyers and Company television broadcast aired an interview with Karl Marlantes (http://billmoyers.com/segment/karl-marlantes-on-what-its-like-to-go-to-war/), a Marine platoon leader, recipient of the Navy Cross and other distinguished service medals, author of "What It Is Like To Go to War", a memoir on the horrors of combat during the Vietnam War and coping with post-traumatic stress disorder. Despite being a successful businessman, Marlantes was troubled for years by his experiences during the conflict - graphically retold in the pages of his book and in the PBS interview, and he delved into an experience that can only be considered paranormal. At one point during the exposition, Bill Moyers asked Marlantes what war had taught him about the nature of evil, and the response was stunning. Marlantes asserted his belief that evil is a real thing, "something that exists, and that it is always possible for us to tune into it; it's part of being in the world...we personify it, Christians came up with the concept of the devil, and I don't believe it that way, but I do believe that we are in a world of opposites, and that somehow we have to make our choices, and that Evil exists." He then went on to describe a mind-bending ordeal that shook him to his core. After having taken part in a mass for the dead celebrated by a Capuchin monk -- a process that involved talking not only to his comrades lost in battle, but to the enemies he had slain during the conflict -- Marlantes returned home and that very same evening, found himself visited by a supernatural presence. "That night there was a presence that came into the room that absolutely terrified me, it was beyond anything I had ever encountered in my life, it was the archetype of shadow. It filled the room, and it was going to get me." The decorated war hero did not hesitate to say that the negative presence caused him to revert into a "five-year old, holding a crucifix" in an effort to allay the visitation. "It was something that I felt. It was absolutely real." Marlantes returned to the see the monk to discuss the ghastly event. The Capuchin suggested that they might have been tampering with a force far more powerful than they suspected. Turning to a superior in his monastic order, described as being more familiar with the details of the mass for the dead, the monk learned that any effort made to loosen evil's grasp on a soul will result in evil fighting back to reassert control. The Marine hero ended the discussion on evil by saying that the matter was brought up with a fellow soldier - a Chumash Indian who had belonged to the Army's Long Range Penetration units - who quickly recognized the matter as an attack by "evil spirits" that was well within the control of his people, recommending a shamanistic practice to dispel the dark forces. In the mid-1970s a young man performing his mandatory military service in the Spanish army was found dead in a deserted area outside his military base on the outskirts of Madrid. He had been found – with a bullet hole in his forehead- by a fellow soldier who had gone to relieve him on guard duty. His submachine gun lay on the ground beside him, and a piece of paper protruded from his flak jacket’s pocket. It turned out to be a message for his father. A teenager far from home, thrust amid strangers in a barracks, may become homesick enough to take his life, and sadly, this is nothing new. But the contents of the message went beyond the usual suicide note one might expect to find on a body. The soldier wrote that he had been visited by a beautiful woman while on guard duty: she was dressed in a “costume of many veils” and had spoken to him about the nature of the universe and the myriad forms of life to be found beyond the confines of the earth, were joy and love were boundless. The mystery female tendered the soldier a tempting invitation – to join her aboard her spaceship, the vehicle that had brought her to our planet, and go away with her to see the wonders of the universe. Taken aback by the thought of deserting his post, the guard refused the offer, and watched her walk away into the darkness. Night turned to day and the soldier was unable to dispel the vision of loveliness from his mind. The nature of the encounter was such that that he was afraid to bring the matter up with his buddies, who would surely jeer at him. Overcome with regret, the soldier remembered that the woman had told him that the way to be with her involved surrendering his own physical life. It was then that he penned the note to his father, making it clear on paper that his suicide was not on account of any hardship or depression brought about by the mandatory service. He promised to return from the afterlife to visit with his family and offer them aid. Upon reporting for guard duty that evening, he turned his service pistol against himself and died. Spanish paranormalist Salvador Freixedo includes this unsettling story in his book Defendámonos de los dioses (Beware of the Gods) but adds some intriguing details. The recruit who came across the suicide’s body took the note and did not show it to anyone at all, much less the military authorities or the boy’s father, the intended recipient of the message. He immediately reported his find, but found himself accused of murdering the sentry. He spent over a year in a military prison but was later released due to a lack of evidence. Who or what was the “lady of many veils” who claimed a world beyond our own as her home? Even the most hardened believer in the ETH would be forced to agree that a bona fide alien traveler would hardly ask for death as the price for a jaunt in a spaceship. More importantly, was the nameless soldier her only victim, or one of many, caught in the “games non-people play”, as John Keel would have put it? Freixedo adds an interesting note with more specifics: On 8 March 1984, Madrid’s Diario 16 newspaper reported the death of another young conscript, Carlos Assua Molinero, found dead of a bullet wound in a sentry box. The precise location was given as one of the guard posts between the military School of Communications and the town of Alcorcón. “The causes motivating the suicide are unknown.” Perhaps the “lady of many veils” wasn’t quite through playing with suggestible minds mesmerized by her charms. A Paranormal Siege of Military Bases? Given the nature of their training, statements made by soldiers, sailors and airmen are often accorded greater weight than pronouncements from other members of society. We present another incident involving personnel of the Spanish military, this time in what appears to have been a close encounter of the 3rd kind (CE-III). On November 25, 1998, a sentry patrolling the perimeter of the Morón de la Frontera Air Base near the city of Seville (Spain) at five o' clock in the morning was startled to hear a sound he likened to "steel plate being cut" (a similarity to the metallic clangor heard by Ms. Sepúlveda in the Chilean case). The sentry shouted a challenge; when no one responded, he loaded his rifle and fired two shots in the air, while letting loose the German Shepherd watchdog that accompanied him on his rounds. Almost immediately following the two loud reports, an entity described as a two meter tall "sort of person" emerged from the surrounding thicket. According to Spanish researcher José Manuel García Bautista, the sentry was astonished by the being's height and its fluorescent green eyes, adding that the darkness kept him from making out its physical details. With his heart pounding, the sentry fired another shot straight into the creature, to no avail. He then ordered the German shepherd to attack; the animal charged the dark figure, but stopped short of it with a loud whimper. The highly trained guard dog cowered back to the sentry, who was at a loss as to what to do next. The entity spared him further confusion by vanishing into the thicket once more. After contacting his superiors over a handheld radio, the sentry was taken to see the base commander, who advised him to keep the whole affair confidential and awarded him a week's leave. But before going off on his furlough, the sentry noticed that his guard dog now sported a long scar running along its left shoulder blade: physical proof of the encounter with the unknown creature. García’s files include even more harrowing cases which have been previously mentioned in INEXPLICATA. One of them is the November 12, 1976 encounter between two young soldiers engaged in guard duty at the Talavera de la Real Air Base near the city of Badajoz (western Spain). In the fateful early morning hours of that November day twenty six years ago, around 2:45 a.m., José María Trejo and Juan Carriozosa were standing guard outside the air base's fuel depot, each in their own guard shack, separated by a distance of two hundred feet. The night, which had otherwise been uneventful, was shattered by a loud, piercing, whistling sound that caused the soldiers to cover their ears for about five minutes. The high-pitched noise ended abruptly, causing the soldiers to emerge from their shacks. Given that they were insuring the safety of tens of thousands of gallons of jet fuel, the possibility of a terrorist attack crossed their minds. Armed with submachine guns, the soldiers decided to comb the area beyond Trejo's guard shack, which seemed to be closer to the source of the sound. They had only advanced a few feet when the high-pitched whistling sound was heard again, loud enough "to drive us crazy," in Carrizosa's words. Things were only getting started. The very moment the second whistle-blast ended, the sky became filled with an intense light, "brighter than a flare", which lasted some twenty seconds. Both soldiers were amazed at the unsuspected display, and were still exchanging questions about it when a third soldier joined them, asking if they'd seen the light. Deciding that these events were a bit too unsettling not to be reported, they summoned the duty corporal, who ordered the three soldiers and a guard dog--a wolf hybrid--to patrol the area and check for anything unusual. A crackling sound arose unexpectedly from a eucalyptus tree. The soldiers unleashed their growling dog, which ran at top speed toward the darkened area. The three men held their submachine guns tightly, expecting to hear the guard dog barking at an intruder. "The wolf-dog came back to us," Trejo told researcher García, "but it seemed dazed, dizzy, as though someone or something had given it a beating or frightened it out of its wits." The three soldiers began shouting challenges into the darkness, fingers on their triggers, expecting at any moment to find themselves in a heated gun-battle with intruders bent on detonating the fuel depot. "I felt a strange sensation," reported Trejo. "Something was standing behind me. Out of the corner of my eye I could see a green light. Spinning around on a heel, I found myself faced with the most fantastic and inexplicable sight I could've envisioned: a nine-foot tall human figure made of green light." Even stranger, remarked another of the witnesses, was that the figure appeared to be composed of small points of green light, giving it a small head, thick torso and extremely long arms. The luminous giant appeared to have neither legs nor feet. Trejo tried to fire a hail of bullets at the figure, but found it impossible to pull his Z-62 sub-machinegun's trigger. Indeed, a gradual stiffening was taking over his body, inducing a sensation of lassitude. He could see and hear perfectly, however, managing to shout: "Get down, they're killing us!" before hitting the ground face first. Trejo's terrified brothers-in-arms were not stricken by the enigmatic paralysis and opened fire against the towering green figure, estimating a total of forty or fifty shots between them. The green giant became brighter, "like the flash of a picture camera" before fading like an image on a television screen. Talavera de la Real was in turmoil. Alarms were sounded as some soldiers took up defensive positions and others headed for the fuel depot. The three sentries were hard pressed to explain what had occurred to an irate superior officer. But what saved them from an uncomfortable stay in the base's stockade was a cold physical fact: despite having ordered fifty men to comb the area in broad daylight, not a single cartridge case was found. A masonry wall behind the place where the green giant materialized should have been pockmarked with bullet impacts, but was otherwise intact. But it was Trejo--the first one to see the green intruder--who would pay the price physically: only a few days after the incident, he was afflicted by sudden bouts of blindness to which neither the base's medics nor physicians at an Army hospital were ever able to explain beyond a vague description of "nervous shock". These cases are not unique to Spain’s military. While the mainstream media has no problem running ghost stories when they find it "quaint" or timely (the flurry of supernatural stories that usually appear around Halloween), one of them stood out because of its unusual geographic location and the fact that it involved U.S. combat troops in a dangerous, active war zone. Stories about Afghanistan's "Forward Operating Base Salerno" made their way across the Internet in 2004, involving American troops standing guard at an old tower overlooking a graveyard. Elements of the 2nd Batallion, 504th Parachute Infantry Regiment felt at one point that they were being subjected to an elaborate prank by other members of their unit, but no one else had heard the sound of eerie, high-pitched laughter of a little girl in the desert night, emanating from the soldiers' radio receiver. The anecdote about the "ghost girl" harkened back to the experience of a couple of Marines who saw a young Afghan child walking a goat down a road in the darkness, their forms clearly visible through their night-vision goggles. However, upon removing their visual aids, the girl and the goat had disappeared. Stranger still, when the Marines put their goggles on again, they found the girl now standing on the guard tower's balcony. The battle-hardened soldiers had been trained to face a ruthless enemy, but not the paranormal: they ran down the stairs and abandoned the tower. Nor was it a one-time incident. On successive nights, the guards found themselves huddling in fear by the radio receiver as an abnormal coldness invaded the tower, feeling an unworldly presence in their midst. The presence of a three-foot tall figure walking around outside the guard post was confirmed by watchers in another tower, but a physical reconnaissance of the surroundings did not turn up anything. 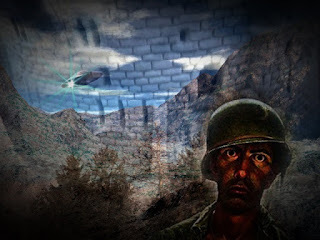 In the mid-1970s, researcher Rufus Drake wrote a feature for Saga UFO Report on the strange activity that seemed to bedevil Williams Air Force Base in Arizona (“Air Force Base Besieged by Saucers”, UFO Report, July 1977, p.37). The incidents ranged from encounters with unknown flying craft chasing T-37 airplanes from the 96th Flying Training Squadron over the desert at relatively low altitudes. Maj. William Royce, involved in one such event, pursued an intruding UFO and managed to close in on it, making out interesting details on its surface as it flew at nearly four hundred miles an hour. Perhaps the most chilling detail in Drake’s assessment of the situation at Williams AFB has nothing to do with shiny objects harassing airplanes, but encounters between security personnel and unknown entities that mirror the events at Talavera de la Real in Spain or more ominously, those at Bentwaters AFB in the United Kingdom. It involves a civilian security guard named James Pitrelli, making his rounds of a bank construction in January 1976 only two miles distant from the air force base. A mass of red light appeared over the trees, moving downward toward a landing. The object settled on a tripodal “landing gear” before the eyes of the stunned guard, who was able to observe a humanoid occupant make its way out of the craft. According to Pitrelli, the entity was humanoid up to a point. It had a massive torso supported by stumplike legs, and dangling arms that reached down to the ground. Worse yet, the unappealing sight appeared to be headed straight for him in strides. The contact experience was interrupted by the sudden appearance of a car along the road, causing the non-human presence to retreat to its conveyance, which rose into the air and vanished into the night. (An interesting side note to this story is that Rufus Drake was a pseudonym – one of many – employed by Robert F. Dorr, a veritable powerhouse in then-burgeoning world of “Men’s Magazines”. Mr. Dorr is a respected author of military affairs and foreign policy with over 70 books to his credit). Perhaps facing poltergeists, strange humanoids and UFOs are among the least of a soldier’s worries. What can we say when the average fighting man or woman has to deal with black magic? Colombia’s El Colombiano newspaper (27 Dec 2011) published a compelling article by Juan Pablo Gómez about the experiences of elements of the Colombian Army with sorcerers and witches employed by the FARC guerrilla organization and other insurgent forces. A soldier from a guerilla-fighting unit encamped in a rural area suddenly began to emit hair-raising guttural sounds and howls, causing other members of the platoon to jump awake in panic. Twisting and turning in his hammock, the soldier could not be awakened from the nightmare that held him within its grip. Over half an hour later, the soldier calmed down and the rest of the platoon stood down, all the while fearing an attack from guerilla forces in the tropical darkness. But the conscripts – largely of peasant stock – knew full well what was going on. These supernatural attacks were handiwork of local witches, whose spells would cause sleeping soldiers to jump awake in the night, brandishing weapons against their companions, spreading confusion and eroding unit cohesiveness. One might dismiss the beliefs of young rural recruits as fanciful, but officers have approached their superiors concerned over the use of magic by the enemy. “Guerilla recruits,” states the article in El Colombiano, “are “prayed over” by the warlocks or witches of the towns they represent. One of these enchantments is meant to spread confusion among the troops. It is a prayer uttered in a kneeling position, and produces a camouflage effect.” The spell does not create a mantle of invisibility or anything of that nature; it causes “soldiers to see other things” than the person protected by the orison. Government forces were also faced with “high strangeness” situations, such as the one experienced by a platoon camping along the banks of the Arauca River, a tributary of the Orinoco that acts as a border between Colombia and Venezuela. When the unit camped for the night during the dry season, the river was no more than three meters wide (10 ft) and no deeper than fifty centimeters. By daybreak, the soldiers were stunned to find themselves facing one of the wildest bodies of water they had ever seen: the roiling, rushing waters were completely impassable. The platoon leader was forced to tell his troops on the other side of the river to remain there until the waters went down. Three soldiers who had attempted to make a crossing were swept away by the river, but survived. Skeptics may well argue that the military – especially combat troops – are subjected to such exquisitely high levels of stress that it can trigger hallucinatory experiences. Yet some of the cases presented here occurred when troops were at a normal, non-combat level of readiness. It could also be argued that the military has not been “singled out” by the paranormal any more than law enforcement has, yet the annals of high strangeness show us that police officers have more than their fair share of brushes with the unusual. Occultists tell us that spirits cling to battlefields and sites of mass carnage and that elementals are attracted to these very same places. These are forces that elude the scientist’s microscope, but are no less real to those who have to confront them…especially in the middle of the night.